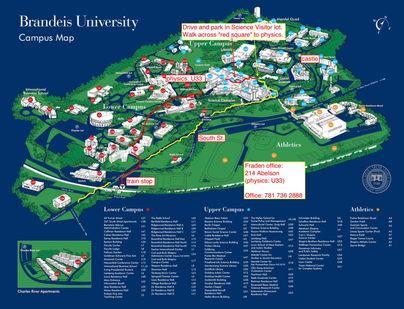 Use this google maps link to drive to the Science Visitor parking lot at Brandeis University. Walk across "red square" to the unmarked back entrance to the Physics Building, identified by the astronomy dome on the roof and as "Brandeis University MAIN CAMPUS" on the google map. 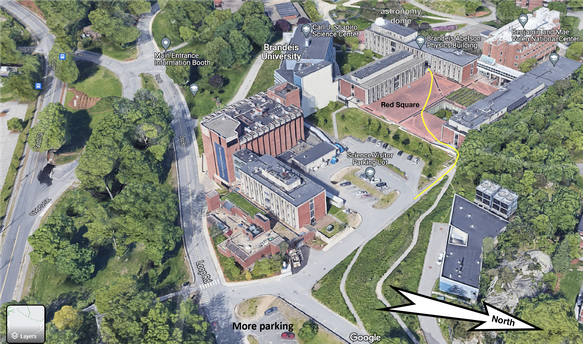 If you are going to legally park in the Science Visitor lot, stop at the entrance booth (L22 in campus map below) and ask for a permit. If the entrance booth is empty, park illegally and give us your parking ticket to tear up. Official directions from Brandeis for getting to campus. The MBTA commuter train to Brandeis from Boston and Cambridge is infrequent, but fast. The train route is the Fitchburg line, which starts at North Station in Boston and stops at Porter Square in Cambridge on its way to Brandeis. The Fitchburg train is distinct from the "T", but connects (navigation skills required) to the Red Line at Porter Square and the Green Line at North Station. From the Brandeis/Roberts stop, walk to the Physics Department following the map above.